Kennen Sie dieses Fiat Cabrio ? Es handelt sich um ein 1970 Fiat 850 Spiaggetta by Michelotti, das 2016 in Monaco, Monte Carlo vom Auktionshaus RM Sotheby’s für 61.600 Euro verkauft wurde. The Michelotti Shellette (a.k.a., Spiaggetta) was the result of a collaboration between yacht designer Phillip Schell and the famed automotive designer Giovanni Michelotti. At this time, Michelotti was one of Italy’s most important and influential stylists, working for the likes of Vignale, Maserati, Lancia, and BMW, among other manufacturers worldwide. 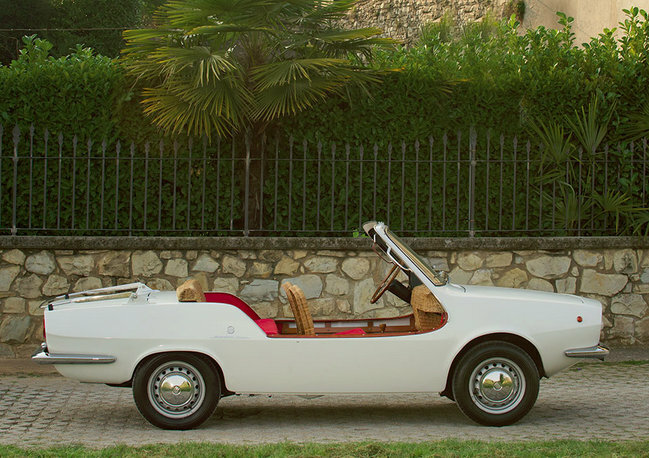 The Spiaggetta was an attractive beach car in the mould of the more famous and well-known Fiat Jolly, but featured unique modern styling that bore little resemblance to the original Fiat 850. Fitted with the 850 Special engine, its drivetrain could move the car comfortably along at 60 mph, and it boasted the “luxury” features of a heater and a stereo system. 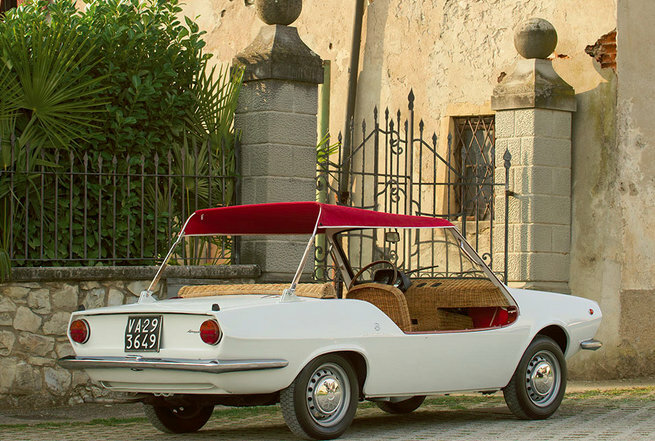 Only 80 such examples of the Spiaggetta are believed to have been built, for such clients as Jacqueline Kennedy Onassis and the Dutch Royal Family, who used them as vehicles on seaside estates or as yacht tenders. Another buyer was the Agusta Family, and the Spiaggetta here in the picture has been part of its collection for many years. Finished in pure white, it boasts the traditional wicker seating for four passengers, reminiscent of summer lawn chairs, with durable red cloth cushions, matching red carpeting, and a matching “surrey” top. Amusingly, even the dashboard inside this car is finished in wicker, and the inside of the doors is timbered, reminiscent of a rowboat. The odometer reads to 160 km/h, which is optimistic but charming. 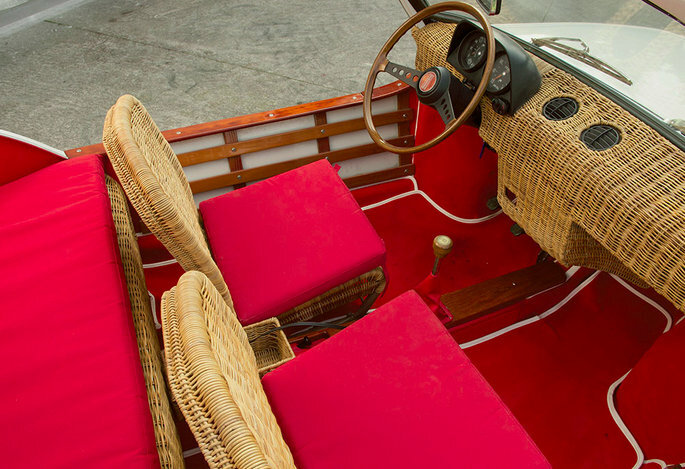 Whether on the beaches and boardwalks in the South of France, the rolling hills and cypress forests in the Monterey Peninsula, or even on the back of one’s yacht, few cars offer the versatility and comfort that this fully restored wicker beach car does. 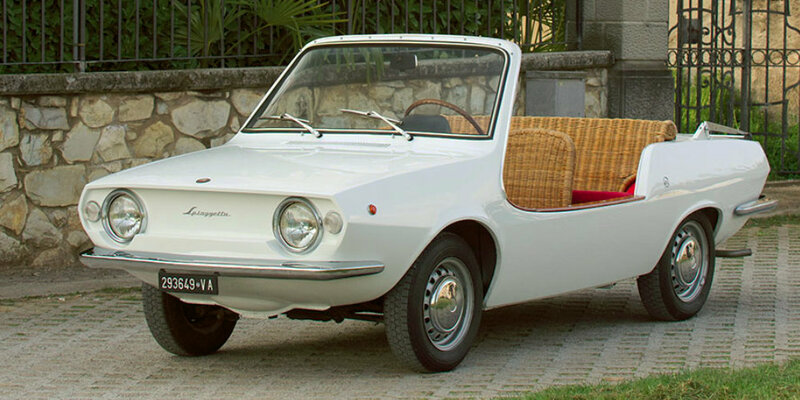 A Spiaggetta is the uncommon alternative to the nearly ubiquitous Jolly, and it is the perfect automobile for the man or woman who really does have everything.